Since 1976, benfluorex has been approved in Europe as a hypolipidemic and hypoglycemic drug, and is commonly used in the treatment of the metabolic syndrome. As a derivative of fenfluramine with an appetite suppressant action, benfluorex is preferentially used in overweight patients. In contrast to fenfluramine and dexfenfluramine, to date, benfluorex has not been reported to be associated with frequent cardiovascular side-effects. The present study reports five cases of severe pulmonary arterial hypertension and one case of valvular heart disease occurring in patients exposed to benfluorex. These individuals were middle age, diabetic females with a body mass index ranging 24.2–49 kg·m−2. No definite causal effect for cardiovascular disease with benfluorex can be drawn from such case reports. However, as benfluorex, like dexfenfluramine and fenfluramine, is metabolised into active metabolite norfenfluramine, further extensive assessment of drug exposure in newly diagnosed pulmonary arterial hypertension or valvular heart disease patients is warranted. Since 1976, benfluorex has been approved in Europe as a hypolipidemic and hypoglycemic drug. Benfluorex is a fenfluramine derivative with central appetite suppressant action. Thus, benfluorex is often used in the treatment of the metabolic syndrome, especially in overweight patients 1. Side-effects of benfluorex are mainly gastro-intestinal and neurological (confusion and dizziness) 2. Two cases of valvular heart diseases associated with benfluorex use have been recently reported 1, 3, as previously demonstrated in patients exposed to fenfluramine derivatives 4. However, unlike fenfluramine, benfluorex has never been reported to cause pulmonary arterial hypertension (PAH) 5–12. The present study reports five cases of severe PAH and one case of valvular heart disease occurring in patients exposed to benfluorex, further suggesting cardiovascular side-effects of benfluorex use. The baseline clinical, functional and haemodynamic data of the five reported cases of severe PAH and one case of valvular heart disease are shown in tables 1⇓ and 2⇓. A 50-yr-old female, with a history of diabetes, systemic arterial hypertension and dyslipidemia, first experienced dyspnoea in December 1998. By March 1999, she was in New York Heart Association (NYHA) functional class III and reported associated dizziness but no syncope or chest pain. Echocardiography demonstrated enlarged right ventricle associated with ventricular septum dyskinesia and an estimated systolic pulmonary arterial pressure (sPAP) of 83 mmHg. No congenital heart disease could be visualised. Right heart catheterisation confirmed severe precapillary pulmonary hypertension (table 2⇑). The work-up for associated causes (connective tissue disease, portal hypertension, HIV infection, congenital heart disease, thyroid disease, left heart disease, chronic respiratory disease with hypoxemia and pulmonary thrombo-embolic disease) was negative and a diagnosis of PAH was established. No BMPR2 mutation was identified. The patient denied having ever taken appetite suppressants, but she had received 150 mg of benfluorex once a day for a metabolic syndrome since 1994. The patient did not complain of significant shortness of breath at that time. This treatment was stopped at the time PAH was diagnosed. She was also started on conventional therapy (diuretic and anticoagulant) and continuous i.v. epoprostenol. However, the disease was not controlled with increasing epoprostenol doses and further addition of sildenafil and bosentan. The patient was then placed on the lung transplantation list and underwent a successful transplantation in January 2005. Pathological examination of the lungs revealed characteristic plexiform lesions (fig. 1⇓), intimal hyperplasia and medial hypertrophy. Pathology specimen obtained from case 1 following transplantation showing characteristic plexiform lesions. Scale bar = 100 μm. A 54-yr-old female was referred for chest pain in June 2002. Her medical history was notable for diabetes, dyslipidemia and depression. The patient was in NYHA functional class III and reported episodes of pre-syncope upon effort. Her symptoms had started 2 yrs prior to referral. Echocardiography demonstrated enlarged right ventricle associated with an estimated sPAP of 60 mmHg. Right heart catheterisation results are shown in table 2⇑. The work-up was negative and a diagnosis of PAH was established. This patient denied ever having taking an appetite suppressant. Her usual medication included benfluorex 150 mg twice daily, which was started in 1999 for a metabolic syndrome. During this time the patient did not complain of significant shortness of breath. Benfluorex was stopped in September 2002 when PAH was diagnosed. She was started on conventional therapy and calcium channel blocker (amlodipine 10 mg once daily, up titrated to twice a day). Her most recent right heart catheterisation, performed in May 2005, was normal under calcium channel blocker. At the last evaluation in May 2007, the patient performed a 6-min walking distance of 450 m and maintained a NYHA functional class I. A 51-yr-old female was referred in December 2006 because of elevated sPAP on echocardiography. Her past history was characterised by mild chronic bronchitis (active smoker, 30 packs·yr−1), diabetes and sleep apnoea syndrome (successfully treated with continuous positive expiratory pressure). Two episodes of unexplained deep vein thrombosis had occurred previously (left inferior limb in 2001 and left superior limb in 2003). The patient mainly complained of dyspnoea that had started 10 yrs prior, leading to a NYHA functional class III. Echocardiography demonstrated enlarged right ventricle associated with moderate right ventricular dysfunction and an sPAP of 82 mmHg. Right heart catheterisation confirmed severe precapillary pulmonary hypertension (table 2⇑). A ventilation/perfusion lung scan showed an isolated sub-segmental defect in the left lower lobe and a pulmonary angioscan ruled out chronic thrombo-embolic pulmonary hypertension. Other associated conditions were excluded and a diagnosis of PAH was established. The patient reported having been treated with benfluorex 150 mg t.i.d. over a 3-month period 10 yrs prior to PAH diagnosis. This was suggested by her physician in an effort to reduce her weight. The patient had experienced shortness of breath within months of starting treatment with benfluorex. She denied ever taking any other appetite suppressant. Specific PAH therapy with bosentan was started in January 2007. A 57-yr-old female was referred in February 2007 after the discovery of pulmonary hypertension during a work-up for persistent dyspnoea. Her medical history was notable for insulin-dependent diabetes mellitus, systemic hypertension and obesity hypoventilation syndrome, which had been treated with oxygen therapy and overnight noninvasive ventilation since 2002, with good compliance and normal overnight pulse oxymetry on such treatment. She complained of severe dyspnoea upon effort and was in NYHA functional class III. Echocardiography demonstrated enlarged right ventricle associated with an sPAP of 74 mmHg. Right heart catheterisation confirmed precapillary pulmonary hypertension (table 2⇑). The work-up for associated causes, including a pulmonary computed tomography scan, was negative and a diagnosis of PAH was established. At the time of PAH diagnosis, the patient’s usual treatment included benfluorex 150 mg t.i.d. for 10 yrs for metabolic syndrome and nebivolol, a beta-blocker, which were both stopped at the first evaluation. She did not complain of significant shortness of breath when starting benfluorex. There was no history of other appetite suppressant intake. The patient was started on bosentan in February 2007. A 55-yr-old female was treated with nocturnal noninvasive ventilation and oxygen therapy since April 2006 for an obesity hypoventilation syndrome and sleep apnoea syndrome. Her personal history was otherwise notable for diabetes mellitus and obesity (body mass index (BMI) of 41 kg·m−2). She complained of persistent dyspnoea and was in NYHA functional class III. Echocardiography demonstrated enlarged right ventricle associated with an sPAP of 59 mmHg. Right heart catheterisation results are shown in table 2⇑. The work-up for associated causes was negative. A diagnosis of PAH was established and the patient reported having taken benfluorex 150 mg t.i.d. for several years, which was stopped 1 yr before PAH diagnosis. She did not complain of significant shortness of breath when starting benfluorex. The patient had also taken dexfenfluramine (Isomeride®, Servier, France) for <3 months several years before. No specific PAH treatment was started. A 51-yr-old female was referred in November 2007 for acute dyspnoea, which had worsened progressively over the last 6 months. Her personal history included obesity (BMI 34 kg·m−2), idiopathic hypopituitarism with substituted thyroid and growth hormone deficiencies, and diabetes mellitus. An echocardiography, performed in 2000, showed normal cardiac function with no significant valvular abnormality. On presentation, a physical examination showed clinical features typical of acute pulmonary oedema due to left heart failure, which resolved after symptomatic treatment. Transthoracic doppler echocardiography completed by transoesophageal echocardiography revealed grade III mitral and aortic insufficiencies with thickening of both valves, reduction of their mobility by retraction and an sPAPof 49 mmHg. Left heart catheterisation confirmed both valvulopathies and associated coronarography were normal. Surgical valvular replacement of mitral and aortic valves was performed 3 months after diagnosis. The macroscopic feature was characterised by marked thickening and retraction of the valves, especially the mitral valve (fig. 2⇓). Histological examination revealed dense fibrosis made up of myofibroblasts in a matrix of mucopolysaccharides with no inflammatory infiltration. 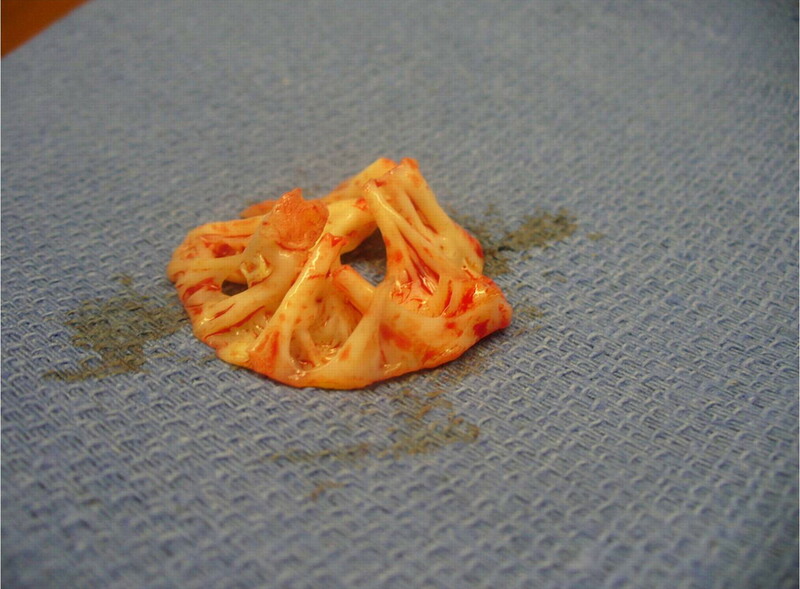 A mitral valve with marked thickening and retraction obtained from case 6. The patient reported that she had taken benfluorex 150 mg t.i.d. since 2001, and dexfenfluramine for <3 months many years before diagnosis. The present study reports six cases of PAH and valvular heart disease in patients exposed to benfluorex, a derivative of fenfluramine. This small case series linking benfluorex exposure and PAH does not demonstrate any causal relationship from benfluorex use to PAH. Well-designed studies are needed to further investigate fenfluramine cardiovascular-like effects of benfluorex use. However, pharmacology background and clinical findings both support the hypothesis that benfluorex may play a key role in this association. Pharmacology of benfluorex and appetite suppressants reported to favour the occurrence of PAH is similar. Benfluorex, like dexfenfluramine and fenfluramine, is metabolised into active metabolite norfenfluramine 1. It is well accepted that norfenfluramine induces hypophagia through serotonin interaction 13. Activation of 5HT serotonin receptors is also the mechanism proposed to be involved in cardiovascular side-effects, including valvular heart disease, as underlined by Rothman et al. 14. Following therapeutic regimens, it seems that less norfenfluramine metabolite is produced from benfluorex than from fenfluramine and dexfenfluramine. As previous reports suggest a dose–response relationship 15, this could explain the rather short duration of fenfluramine exposure (3–12 months) observed by Souza et al. 16, which contrasts with the benfluorex exposure of the present cases that range from 3 months to 10 yrs. However, two patients had a history of dexphenfluramine co-medication (although only for 3 months), making the interpretation of the benfluorex-associated risk complex and difficult. Clinical findings of the five PAH cases from the present study are very similar to the published cases related to fenfluramine use. Benfluorex was introduced before PAH-related symptoms began and exposure was long enough to qualify as a suspected cause of PAH (table 1⇑). In the recent study by Souza et al. 16 of 109 PAH cases associated with fenfluramine exposure, the work-up for associated or secondary causes was also negative and the median time between exposure and onset of symptoms was 4.5 yrs. In the valvular heart disease case, histological findings were identical to those described in the two previous reports with benfluorex 1, 3, as well as to that observed with the anorexigens fenfluramine and dexfenfluramine 17. Benfluorex was approved in Europe more than 30 yrs ago. In 2006, benfluorex ranked 44 among the most sold medicines in France, just after Ventolin® (GlaxoSmithKline, UK: Agence française de sécurité sanitaire des produits de santé; personal communication). To the current authors’ knowledge, benfluorex is marketed in four European countries (France, Italy, Portugal and Switzerland), as well as in many Asian countries. Since 1995, 12 notifications of possible benfluorex-associated PAH in France have been reported 18. The present PAH and valvular heart disease case reports further raise the possibility that benfluorex could indeed play a role in the occurrence of these cardiovascular events. In addition, it is likely that this association has been overlooked because benfluorex is not labelled as an appetite suppressant and, as a result, is not routinely assessed for in the medical history of PAH patients. Thus, this may lead to under screening and under report. Another difficulty is the unremarkable presentation and clinical course of benfluorex-associated PAH cases. Similarly, in the recent report by Souza et al. 16, all characteristics of the disease were similar in 109 patients with fenfluramine-related PAH and 496 idiopathic and familial PAH patients 16. In fenfluramine-associated PAH, a BMPR2 mutation was present in 22.5% of PAH cases related to appetite suppressant, as compared with 25% of idiopathic PAH cases. In the five cases reported herein, only one patient was tested for BMPR2 mutation and the result was negative. Finally, 8.3% of fenfluramine-associated PAH patients had a positive acute vasodilator challenge; similarly one of the five present study cases was an acute nitric oxide responder. Overweight patients represent a particular subgroup of PAH. Even though obesity is not a risk factor itself, it coexists with related comorbidities which can act as risk factors for PAH. Sleep apnoea, ventilation-perfusion mismatch leading to hypoxemia, thromboembolic disease, left heart disease, hypothyroidism and exposure to anorexigens are all risk factors that can be found in obese patients 19. The cases reported herein illustrate this complexity, including past exposure to both dexfenfluramine and benfluorex in two patients (table 1⇑). Based on the present case series which indicates the possible fenfluramine-like cardiovascular effects of benfluorex use, French pulmonary vascular specialists have been informed that benfluorex should be included in the list of agents possibly linked to pulmonary arterial hypertension. Cases of pulmonary arterial hypertension in patients with a benfluorex exposure should be reported to the medical authorities in order obtain a better picture of the situation. Therefore, the present authors encourage physicians to investigate and report all drug exposure in pulmonary arterial hypertension patients in order to collect more data and eventually influence authorities to review the benefits of such agents. More specifically, case–control studies similar to those previously performed to document the role of fenfluramine derivatives in PAH might be needed to analyse fenfluramine-like cardiovascular effects of benfluorex use. The authors would like to thank J. Barra, P. Le Mevel and G. Le Garff from the Groupe HTAP de Bretagne Occidentale (Hôpital de la Cavale Blanche, Brest, France). Noize P, Sauer M, Bruneval P, et al. Valvular heart disease in a patient taking benfluorex. Fundam Clin Pharmacol 2006;20:577–578. Moulin P, Andre M, Alawi H, et al. Efficacy of benfluorex in combination with sulfonylurea in type 2 diabetic patients: an 18-week, randomized, double-blind study. Diabetes Care 2006;29:515–520. Rafel RJ, Casanas MR, Anguera FN, et al. [Valvular heart disease associated with benfluorex]. Rev Esp Cardiol 2003;56:215–216. Brenot F, Herve P, Petitpretz P, Parent F, Duroux P, Simmonneau G. Primary pulmonary hypertension and fenfluramine use. Br Heart J 1993;70:537–541. Chin KM, Channick RN, Rubin LJ. Is methamphetamine use associated with idiopathic pulmonary arterial hypertension?. Chest 2006;130:1657–1663. Rich S, Rubin L, Walker AM, Schneweiss S, Abenhaim L. Anorexigens and pulmonary hypertension in the United States: results from the surveillance of North American pulmonary hypertension. Chest 2000;117:870–874. Rothman RB. The age-adjusted mortality rate from primary pulmonary hypertension, in age range 20 to 54 years, did not increase during the years of peak “phen/fen” use. Chest 2000;118:1516–1517. Simonneau G, Fartoukh M, Sitbon O, Humbert M, Jagot JL, Hervé P. Primary pulmonary hypertension associated with the use of fenfluramine derivatives. Chest 1998;114: Suppl. 3 195S–199S. Rudarakanchana N, Trembath RC, Morrell NW. 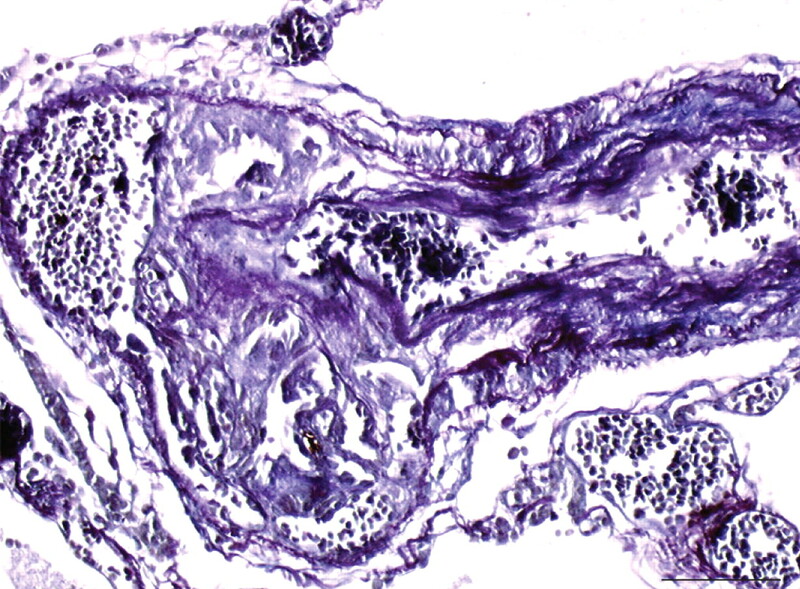 New insights into the pathogenesis and treatment of primary pulmonary hypertension. Thorax 2001;56:888–890. Chaouat A, Coulet F, Favre C, et al. Endoglin germline mutation in a patient with hereditary haemorrhagic telangiectasia and dexfenfluramine associated pulmonary arterial hypertension. Thorax 2004;59:446–448. Setola V, Dukat M, Glennon RA, Roth BL. Molecular determinants for the interaction of the valvulopathic anorexigen norfenfluramine with the 5-HT2B receptor. Mol Pharmacol 2005;68:20–33. Rothman RB, Baumann MH, Savage JE, et al. Evidence for possible involvement of 5-HT(2B) receptors in the cardiac valvulopathy associated with fenfluramine and other serotonergic medications. Circulation 2000;102:2836–2841. Li R, Serdula MK, Williamson DF, Bowman BA, Graham DJ, Green L. Dose-effect of fenfluramine use on the severity of valvular heart disease among fen-phen patients with valvulopathy. Int J Obes Relat Metab Disord 1999;23:926–928. Souza R, Humbert M, Sztrymf B, et al. Pulmonary arterial hypertension associated with fenfluramine exposure: report of 109 cases. Eur Respir J 2008;31:343–348. Kurz X, Van EA. Valvular heart disease associated with fenfluramine-phentermine. N Engl J Med 1997;337:1772–1773. Agence française de sécurité sanitaire des produits de santé. Répertoire des spécialités phramaceutiques. http://www.agmed.sante.gouv.fr Date last accessed: January 14, 2009. Sztrymf B, Ioos V, Sitbon O, Parent F, Simmonneau G, Humbert M. [Pulmonary hypertension and obesity]. Rev Pneumol Clin 2002;58:104–110.